This time of year I always seem to have dribs and drabs of pumpkin puree in my refrigerator. With the exception of pumpkin pie, most recipes call only for a portion of a can and certainly not a whole pumpkin’s worth. As a result, pumpkin puree finds its way into lots of things: smoothies, pancakes, cookies and the morning oatmeal. For this recipe, I’m using the pumpkin not only to add a nice color to the bread, but to replace some of the oil. The original recipe called for 1/2 cup of olive oil – some for the dough and the remaining amount for the spice blend. I’ve replaced the olive oil with the more fragrant and trendy coconut oil. The end result is toasty golden flatbreads run through with dashes of cumin, coriander, turmeric and paprika that have a crisp exterior and a nice chew. The technique creates very thin layers of bread and it smells wonderful while cooking. Perfect with Indian food. If you haven’t done so, please take some time to email me your selections for the best recipes (one per course) from the Virtual Vegan Potluck. You can also now follow the VVP blog by visiting the News page and entering your email address. You know that little bit of pumpkin puree you have in the fridge? 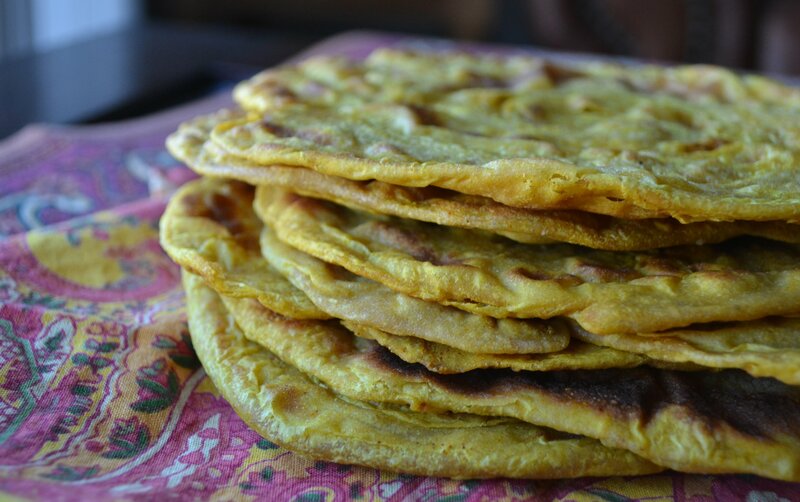 Use it to make these delicious spiced pumpkin flatbreads! In a small bowl, whisk together the pumpkin and water. In a large bowl, combine the flour and salt and then add the pumpkin mixture, stirring until a soft dough forms. Add more water if dough seems dry; more flour if it is too wet and sticky. Turn dough out onto floured surface and knead for about 15 minutes. Place dough in a lightly-oiled bowl, cover with plastic wrap and let sit for 1 hour. In a small bowl or measuring cup, combine the coconut oil and spices. Set aside. Divide dough into 12 equal pieces. Flatten a piece of dough and roll it out into a very thin disk – about 9-inch round. Keep remaining dough balls covered. Spread about 1 teaspoon of the coconut oil mixture onto the flattened dough and then roll it tightly into a long cylinder (much like in the Cuban cigar Seinfeld episode). Coil the cylinder into a tight spiral, gently press and then transfer to a large piece of parchment paper. Cover loosely with plastic wrap and proceed with the remaining dough. Heat a large cast-iron skillet on medium-heat. Tape a large piece of parchment paper onto a work surface and roll out one of the spirals to a 6″ or so round. Plop into the skillet and cook until puffy and brown, then flip and cook the other side. This takes only a few minutes. Transfer to a plate and cover with a towel to keep warm. Continue with the remaining spirals. I have a whole mess of them tucked into the freezer ;-)! Of course you do! I need a deep freezer, I can’t fit anything in mine because it’s so chock full of green smoothie stuff. I shudder to think what used to be in my freezer…. Definitely trying this THIS week!! Thanks for the recipe!! Pumpkin and trendy coconut oil are staples in my house, because well you know I’m so trendy. I could eat these any day and all day…who said the world isn’t flat? You are a trendsetter, my dear!! So, tell me – what should I be buying?!! I’ll take a half dozen please and thank you 🙂 I get a real craving for pumpkin everything this time of year. Me, too, Steve! You’ve got to enjoy it while it’s out there! Your “LOVE” is duly noted and appreciated :-)! Woohoooo! Diplomas, coming up! I have fingers and toes crossed for a speedy delivery of the aforementioned documents. We will all be the beneficiaries of your newfound time in the kitchen. Hope you enjoy the flatbreads! A perfect match, I’d say! Hehe – pretty close at any rate ;-)! Thanks, Richa – I remember it being quite good ;-)! So long ago! These look absolutely divine, but I’ve never heard of pumpkin puree in a can before. Pumpkins are not such a staple in the UK as they are in the States, and I’m not sure where I’d get this stuff but I’ll keep an eye out. I could fairly chomp my way through your flatbreads. Applesauce is even less well known here! Honestly, I hadn’t heard of it until I saw it in your blog. Your pumpkin flavoured flatbreads look so good, so tempting too! How is it possible that only 2 tablespoons pumpkin can give these tasty flatbreads their orange colour? Do you use a special deep orange colour pumpkin? I used 1/2 cup of home-made pumpkin puree yesterday & made vegan pumpkin pancakes with it & my pancakes weren’t at all orangey-like? Maybe , you know the answer??? thanks! Thanks, Sophie! The secret is the turmeric 😉 – not the pumpkin puree! These look great! I’m looking forward to trying them. Hi Rebecca! Thanks for stopping by! They take a bit of effort, but are well worth it. Works for me! I’ll bet they’d make a delicious combination. Wow these look pretty amazing!!! Yum!! Your pumpkin flatbreads look so delicious! They look so light! Oooh this looks like it would be delicious on so many things!!! I love this idea- everything about it sounds so delicious- all the spices, the pumpkin, the texture. I wish I was at home so I could make some of these with the leftover pumpkin in my fridge! Thanks, Kristy – it was difficult not scarfing them all down in one sitting! How did I miss this! 😀 I love any kind of flat bread! I can’t believe I don’t have a banana bread recipe! But apparently I don’t! I’ve got banana bread pancakes and awesome peanut butter-banana muffins…sigh. Sorry to leave you in the lurch, Anne!